The part you are most familiar with! 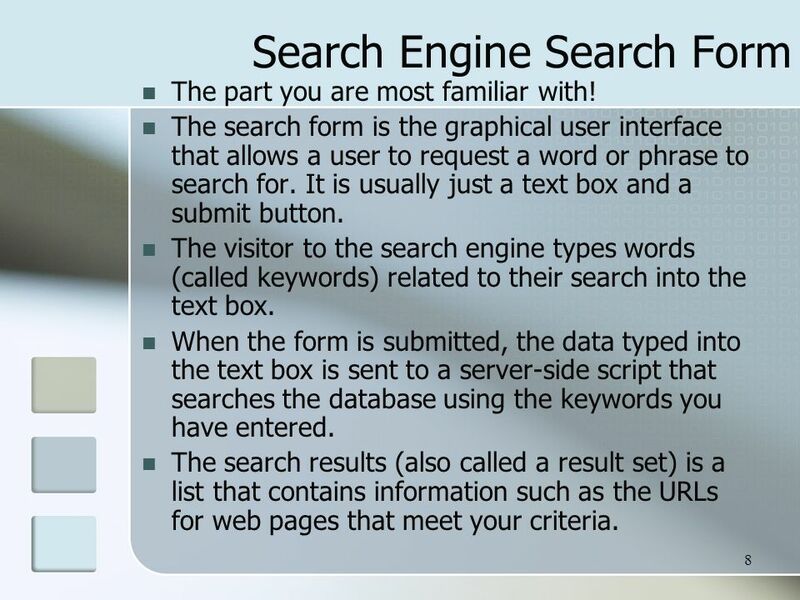 The search form is the graphical user interface that allows a user to request a word or phrase to search for. It is usually just a text box and a submit button. 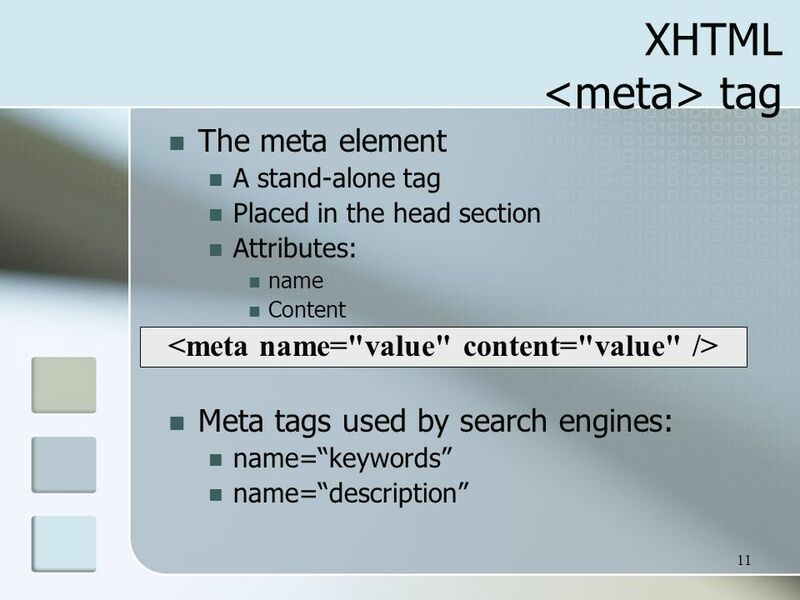 The visitor to the search engine types words (called keywords) related to their search into the text box. 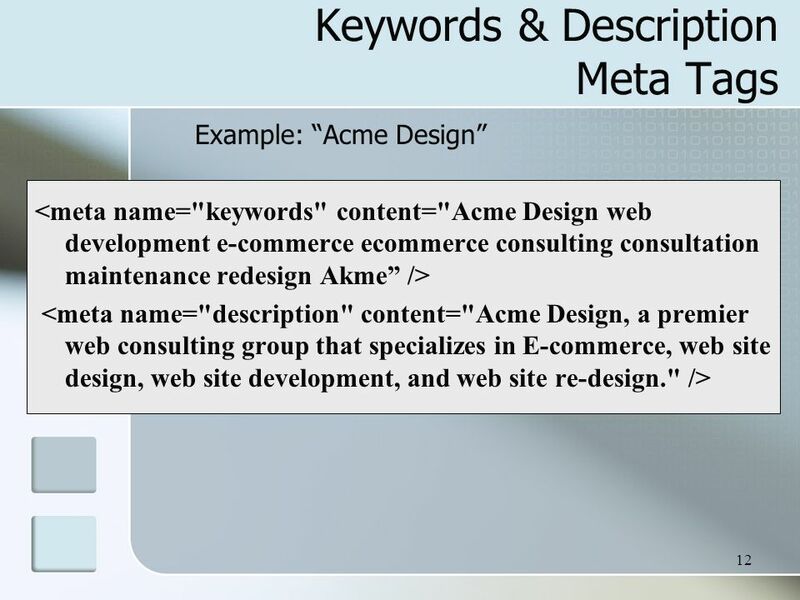 When the form is submitted, the data typed into the text box is sent to a server-side script that searches the database using the keywords you have entered. The search results (also called a result set) is a list that contains information such as the URLs for web pages that meet your criteria. 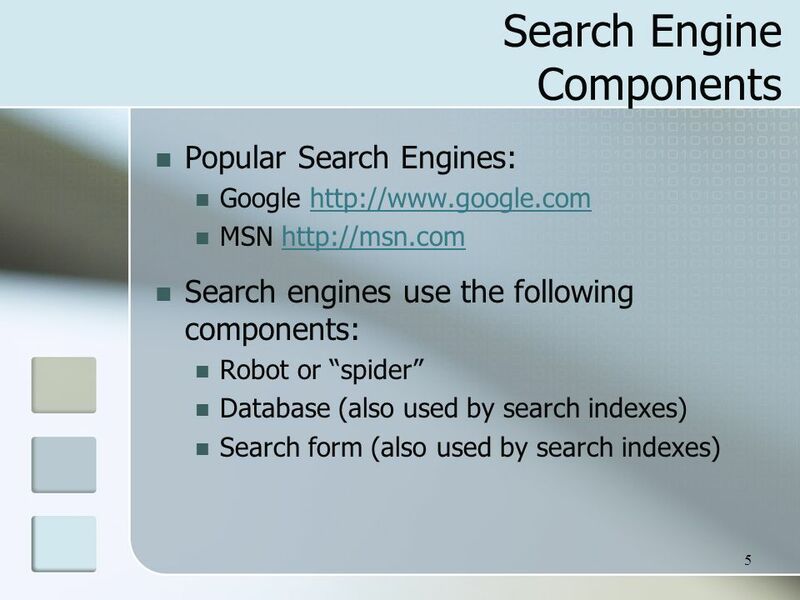 A list of items that describe Web pages matching the search terms. 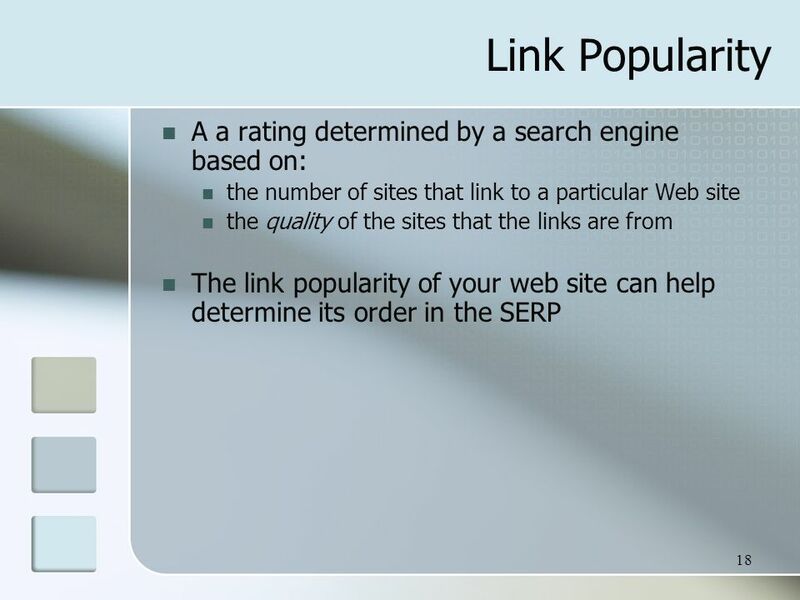 Each item contains a link to a page along with additional information that might include the page title, a brief description, the first few lines of text, the size of the page, and so on. 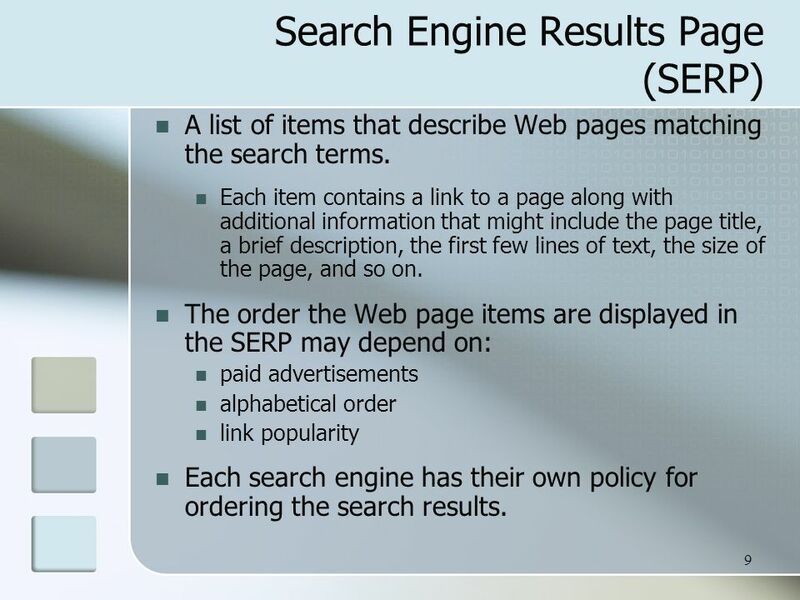 The order the Web page items are displayed in the SERP may depend on: paid advertisements alphabetical order link popularity Each search engine has their own policy for ordering the search results. 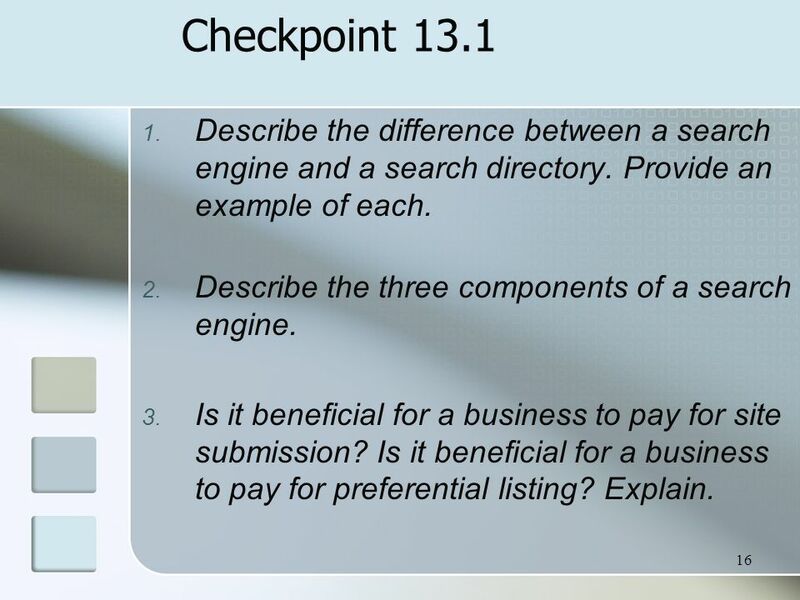 16 Checkpoint 13.1 Describe the difference between a search engine and a search directory. Provide an example of each. 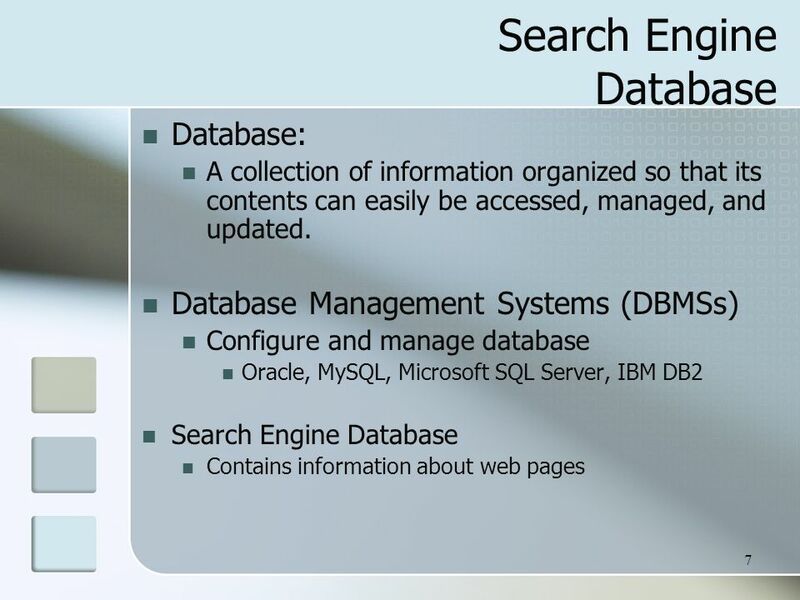 Describe the three components of a search engine. Is it beneficial for a business to pay for site submission? 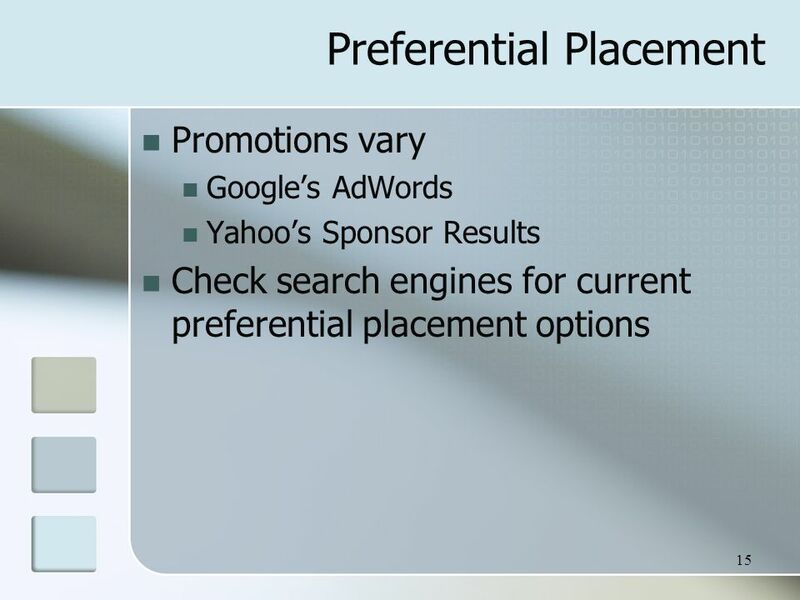 Is it beneficial for a business to pay for preferential listing? Explain. 21 Checkpoint 13.2 1. Are the results returned by various search engines really different? Choose a place, music group, or movie to search for. 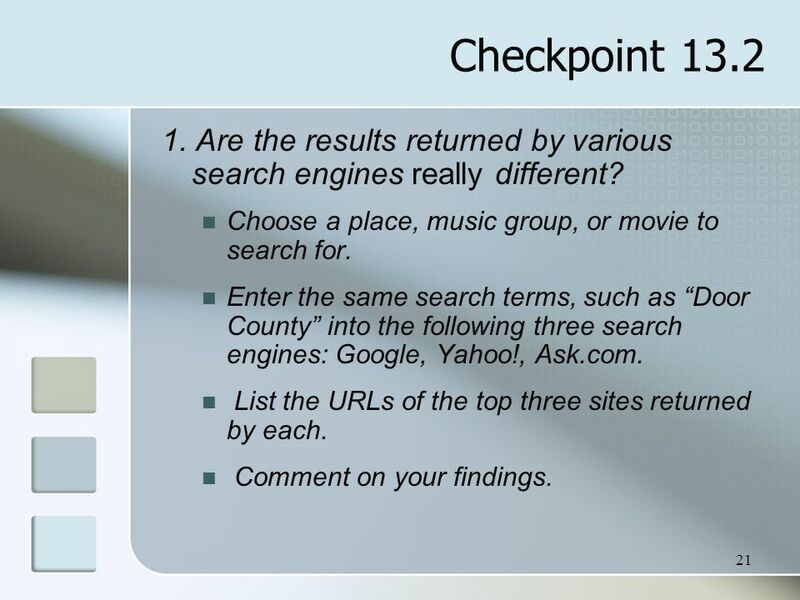 Enter the same search terms, such as “Door County” into the following three search engines: Google, Yahoo!, Ask.com. List the URLs of the top three sites returned by each. Comment on your findings. 22 Checkpoint 13.2 2. 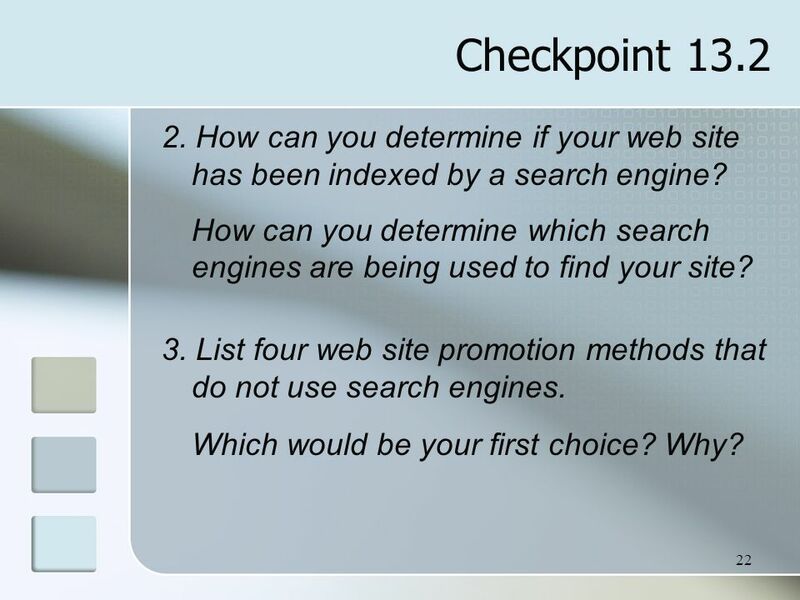 How can you determine if your web site has been indexed by a search engine? 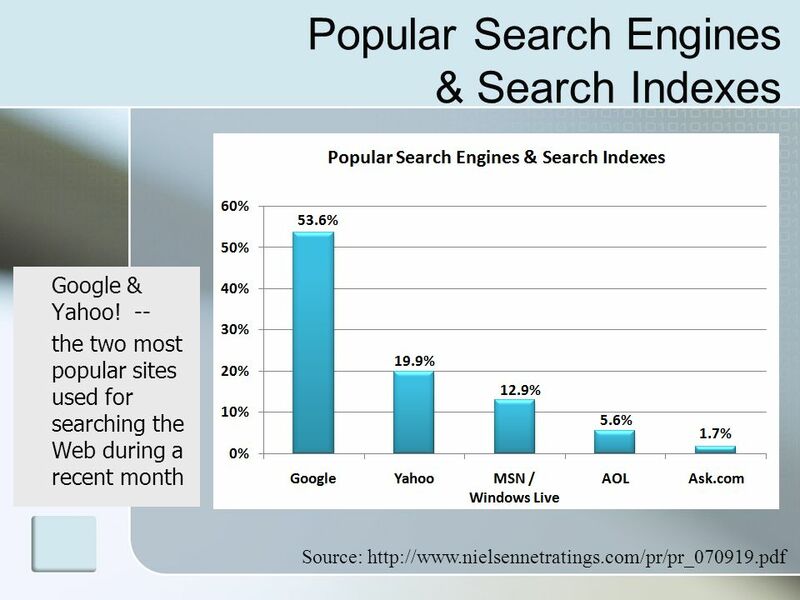 How can you determine which search engines are being used to find your site? 3. 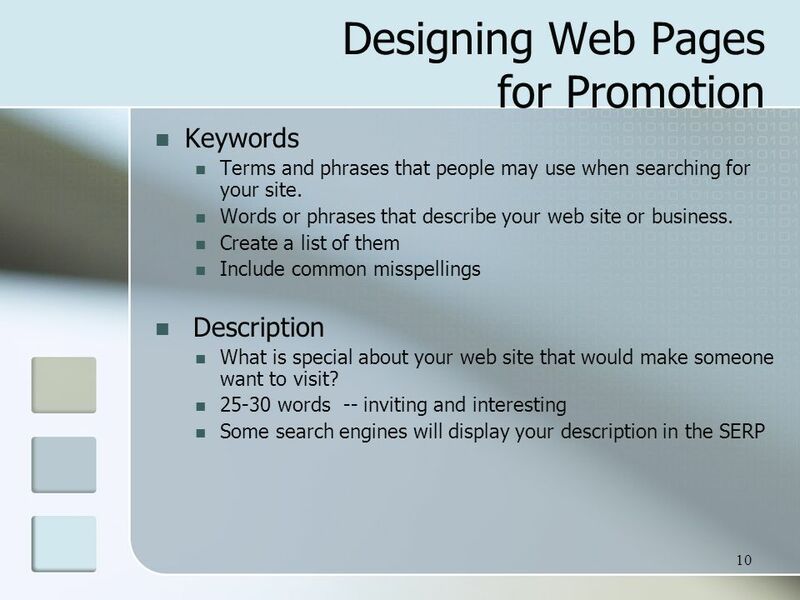 List four web site promotion methods that do not use search engines. Which would be your first choice? Why? 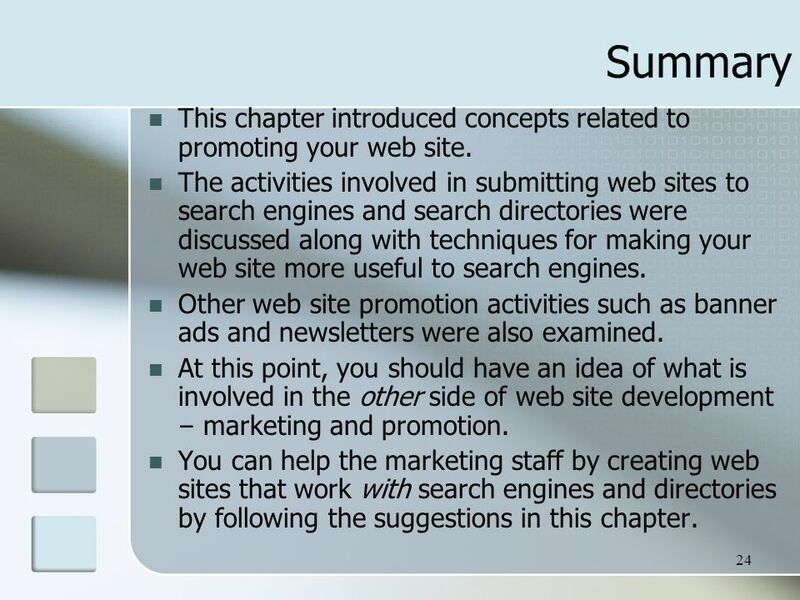 24 Summary This chapter introduced concepts related to promoting your web site. 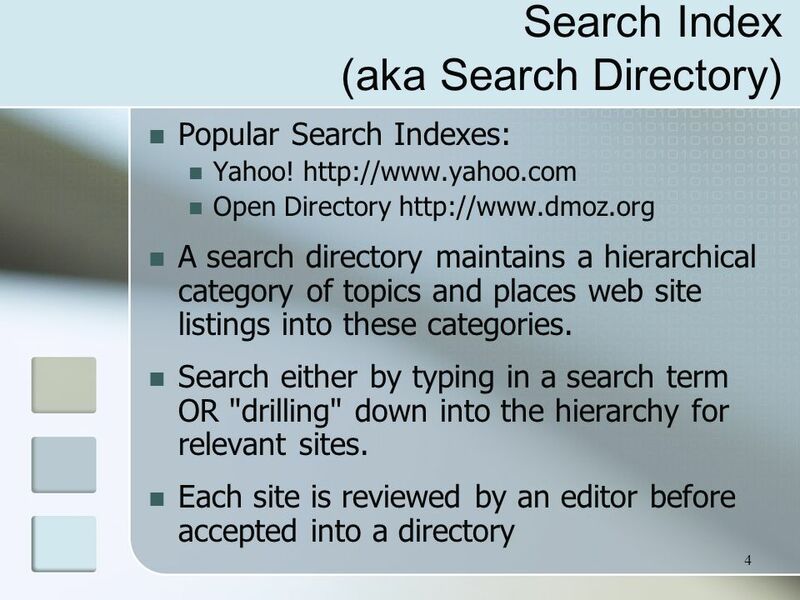 The activities involved in submitting web sites to search engines and search directories were discussed along with techniques for making your web site more useful to search engines. 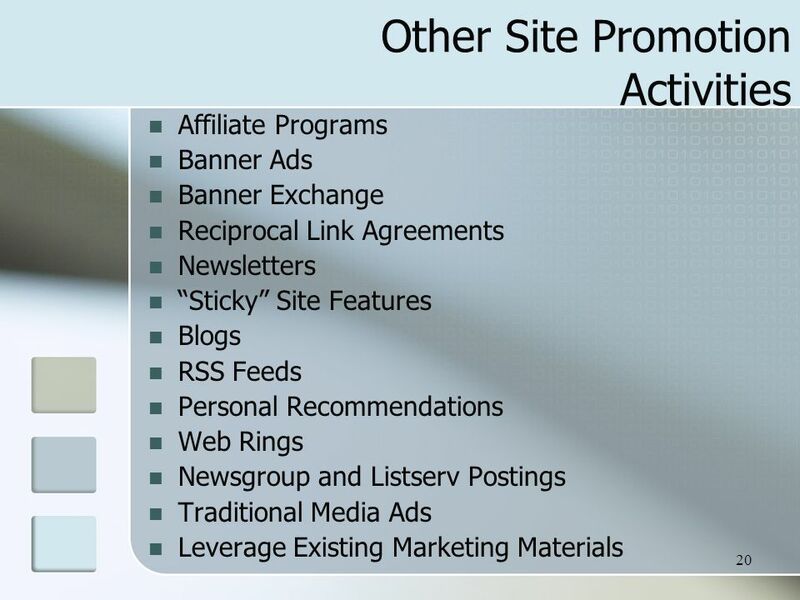 Other web site promotion activities such as banner ads and newsletters were also examined. At this point, you should have an idea of what is involved in the other side of web site development – marketing and promotion. 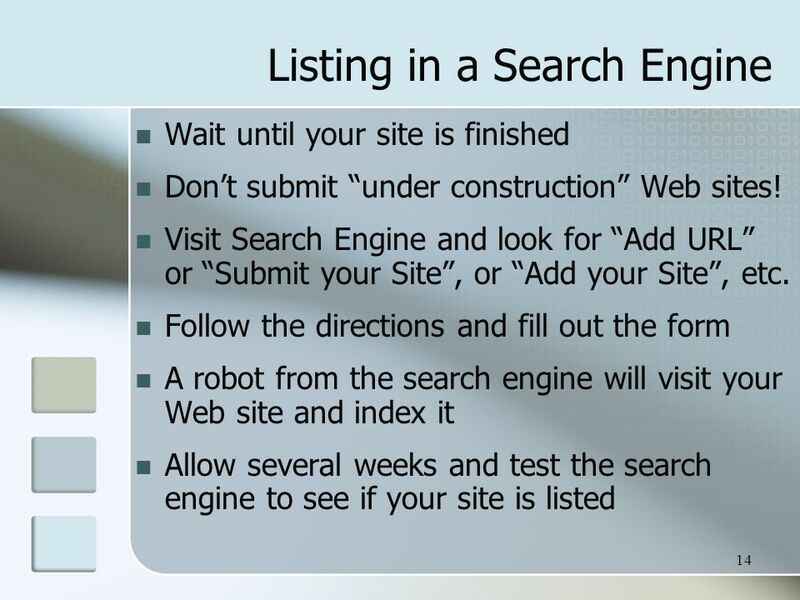 You can help the marketing staff by creating web sites that work with search engines and directories by following the suggestions in this chapter. 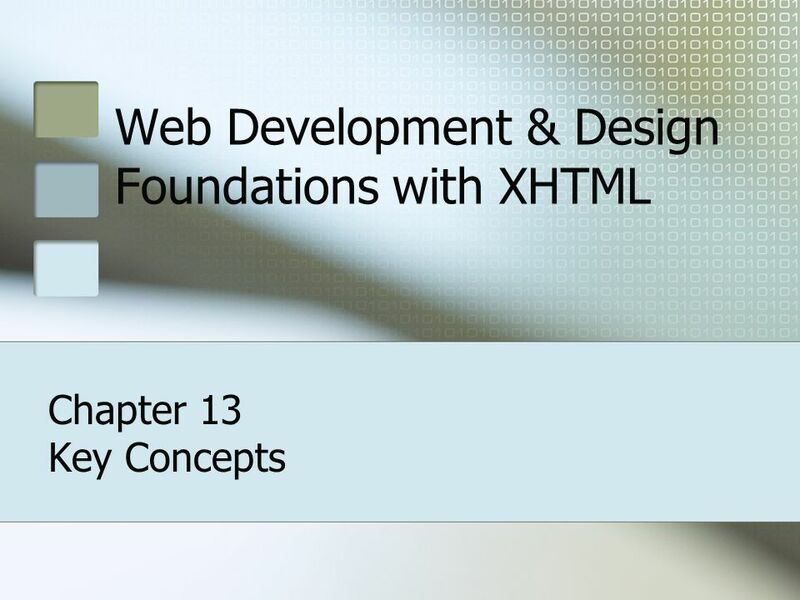 Download ppt "Web Development & Design Foundations with XHTML"
E-Business and e-Commerce. e-commerce and e-business e-commerce refers to aspects of online business involving exchanges among customers, business partners. 1. XP 2 * The Web is a collection of files that reside on computers, called Web servers. * Web servers are connected to each other through the Internet. BeKnown How-to: Company Profiles & Jobs App for Timeline. Determine Eligibility Chapter 4. Determine Eligibility 4-2 Objectives Search for Customer on database Enter application signed date and eligibility determination. XP New Perspectives on Introducing Microsoft Office 2003 Tutorial 1 1 Using Common Features of Microsoft Office 2003 Tutorial 1. WORDPRESS. 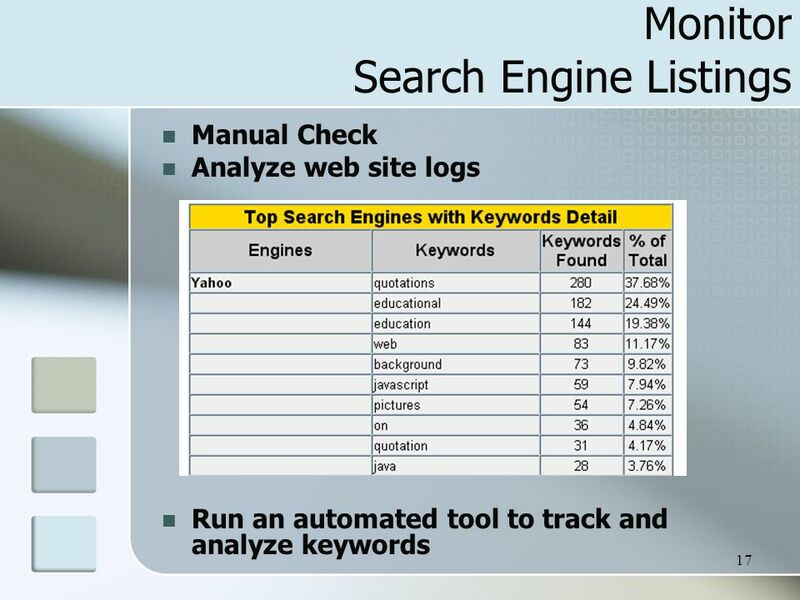 SEO AKA – “Search Engine Optimization” Technique to make sure large search engines like Google, Yahoo, and Bing find your site and let others. How to create a wiki using pbwiki. Step 1: Choose a wiki website I have chosen. 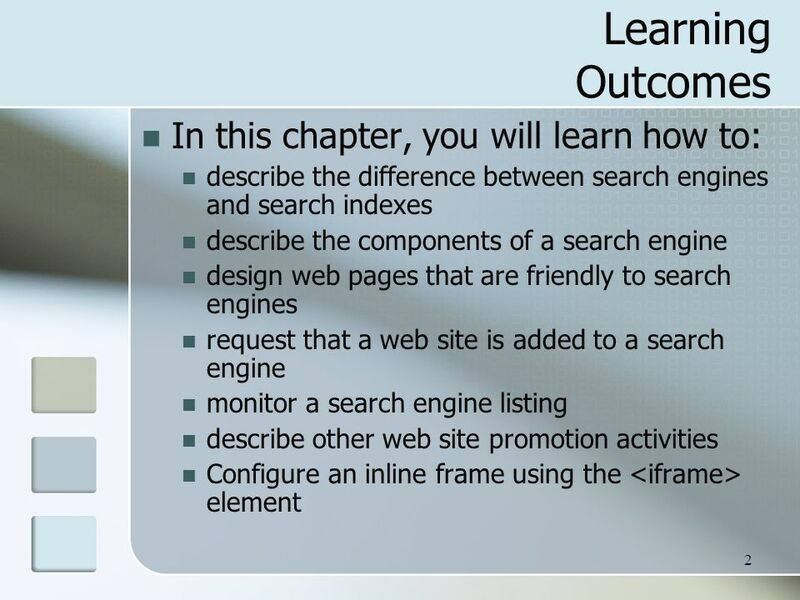 XP New Perspectives on Browser and Basics Tutorial 1 1 Browser and Basics Tutorial 1. ® Microsoft Office 2010 Browser and Basics. Copyright © Terry Felke-Morris WEB DEVELOPMENT & DESIGN FOUNDATIONS WITH HTML5 Chapter 13 Key Concepts 1 Copyright © Terry Felke-Morris. 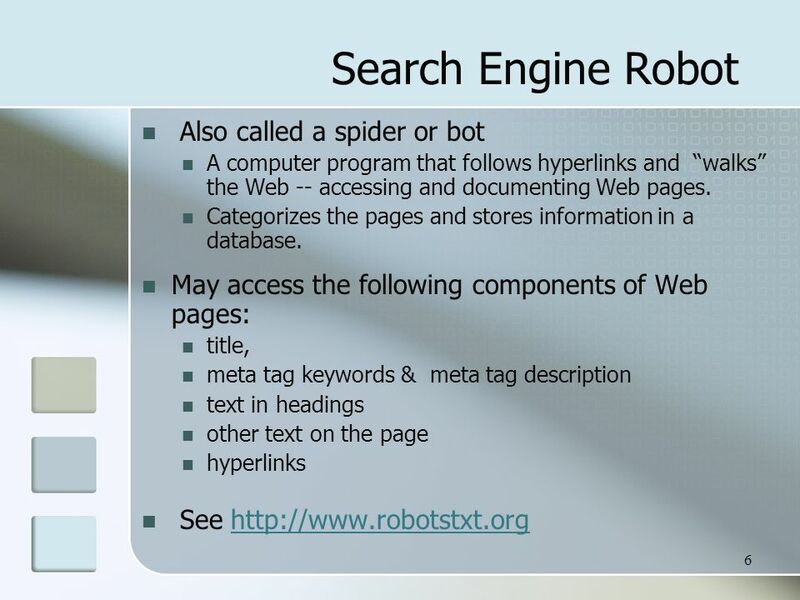 Searching The Web Search Engines are computer programs (variously called robots, crawlers, spiders, worms) that automatically visit Web sites and, starting. IS 360 Web Promotion. 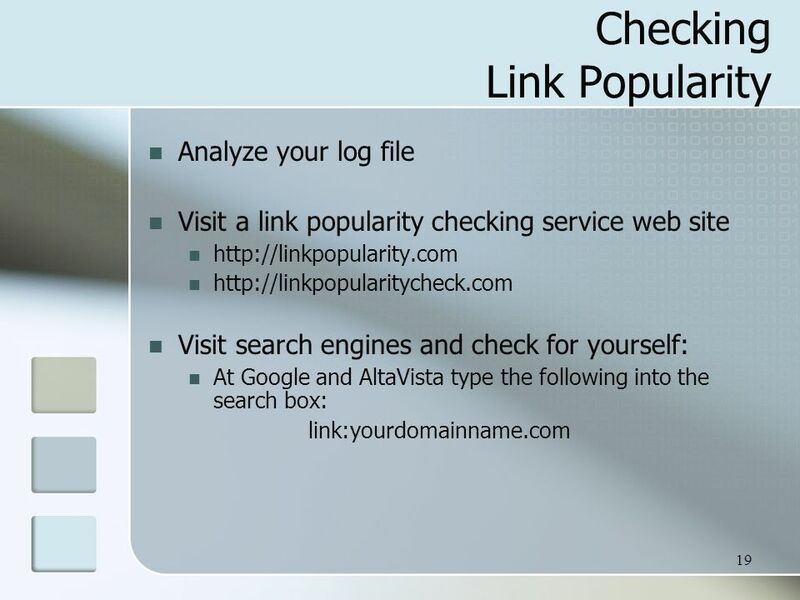 Slide 2 Overview How to attract visitors. 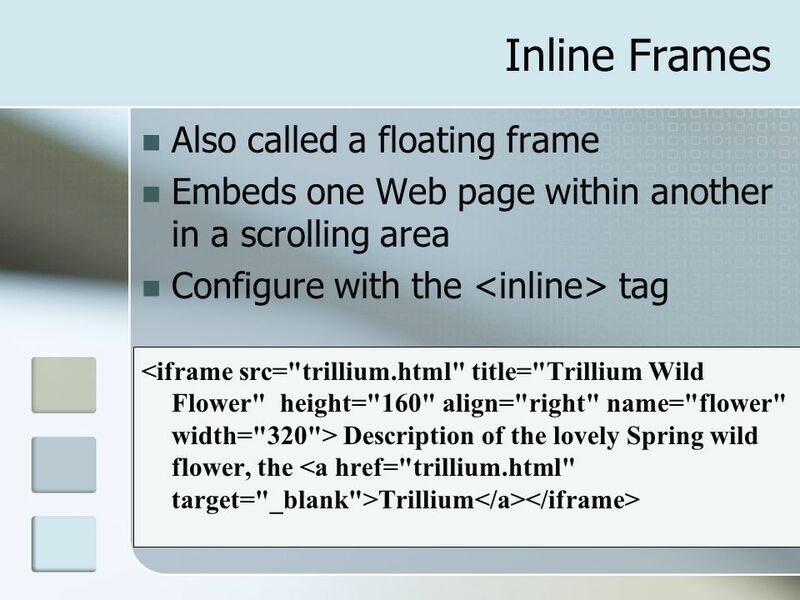 Introduction Web Development II 5 th February. Introduction to Web Development Search engines Discussion boards, bulletin boards, other online collaboration. 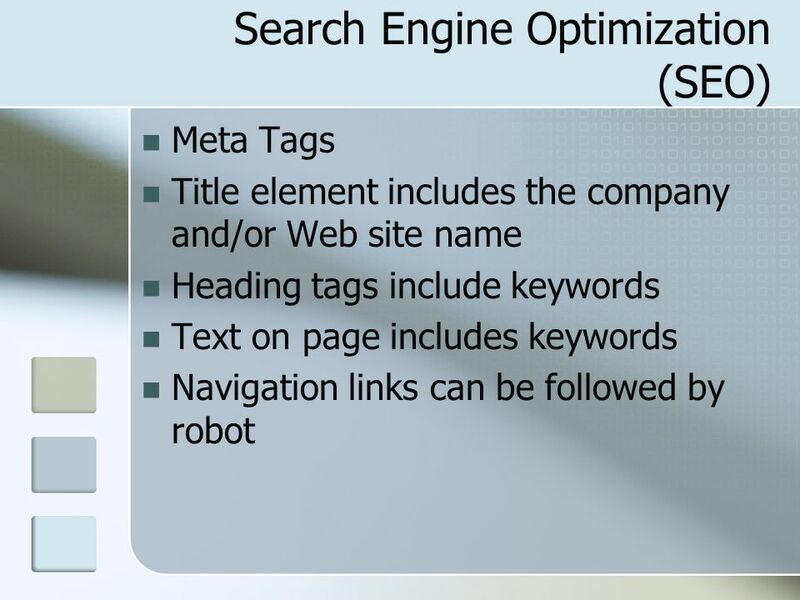 Search Engine Optimization (SEO) Presentation By Celina Jonesi Small Business Seo – KG Tech.